Our holiday was over and we were on our way home. 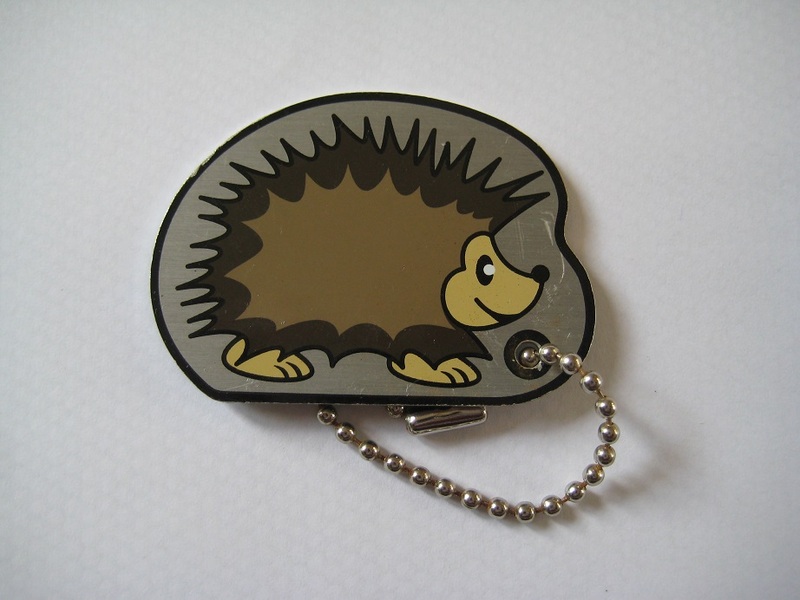 A simple, if long, drive up the A30, then the A303, then the M3 … but … then again, there were yet more geocaching targets that we could achieve, without altering our journey very much. We had equalled our maximum caching streak (consecutive number of consecutive days caching). And we had never found a cache in Dorset. Aha! Two more targets to aim at. And a handy place to break for lunch. And a way to indulge our love of numbers and counting things and statistics. We happily agreed on those new targets and Mr Hg137 selected three caches on the outskirts of Shaftesbury. 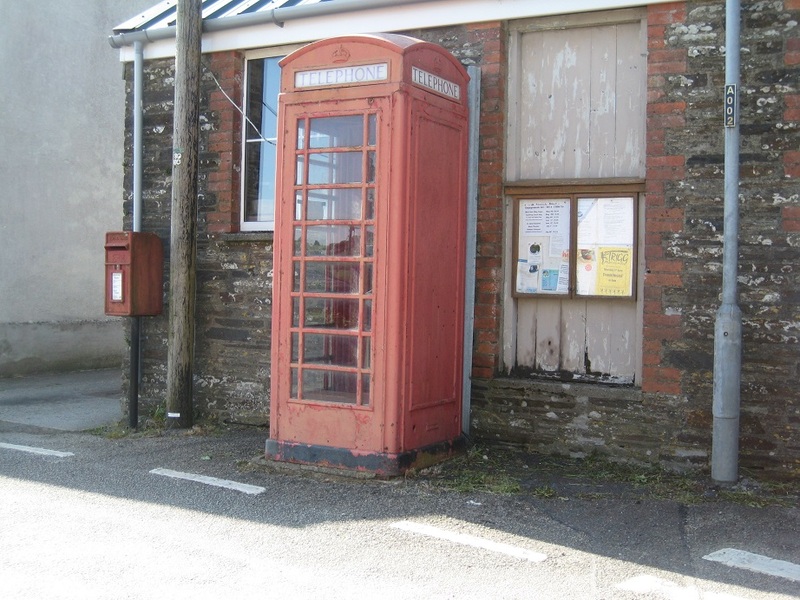 We packed up and left Liskeard, and Cornwall, and drove eastwards through Devon, Somerset, and Wiltshire. As lunchtime approached we turned aside and drove south just a little way into Dorset. 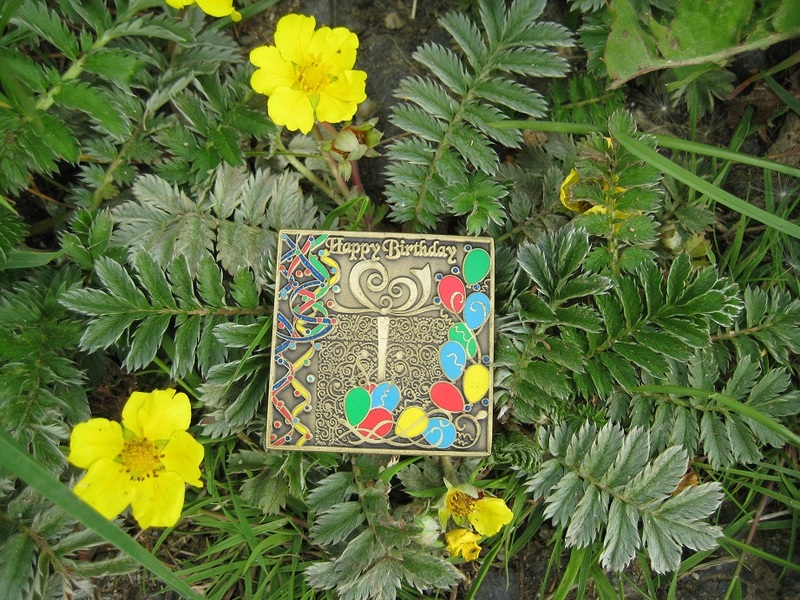 The first two caches of the three chosen were from the ‘There and Back’ series. 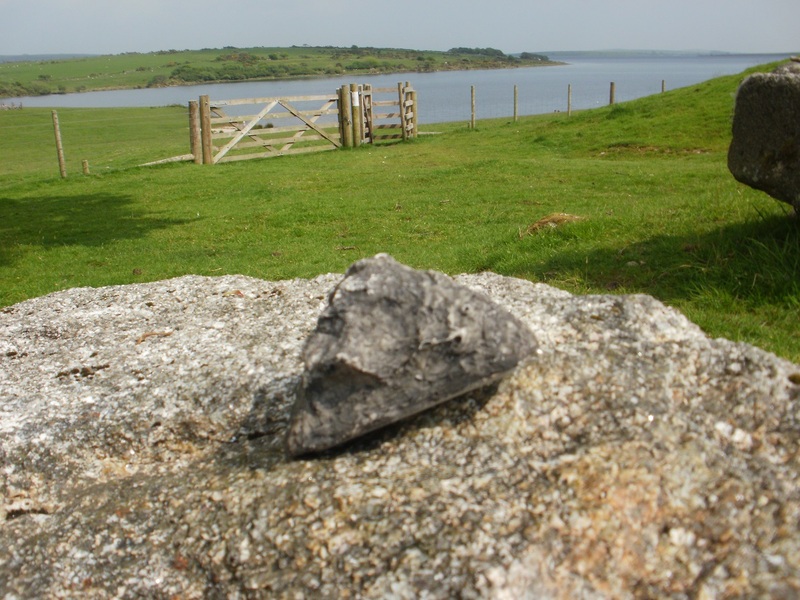 The first of these was hidden somewhere near a stile – or was it? We spent a while looking under, around, and beside it, but couldn’t spot anything that might be a geocache. Never mind, we still had two caches in reserve to get to our targets. The next cache we attempted was from the same series, placed in a side-road on the edge of the town. I was sent out to search while Mr Hg137 turned the geocar around. As I unsuccessfully examined all sides of the likely location, Mr Hg137 wound down the car window and pointed … there it was! I felt rather unobservant and small. 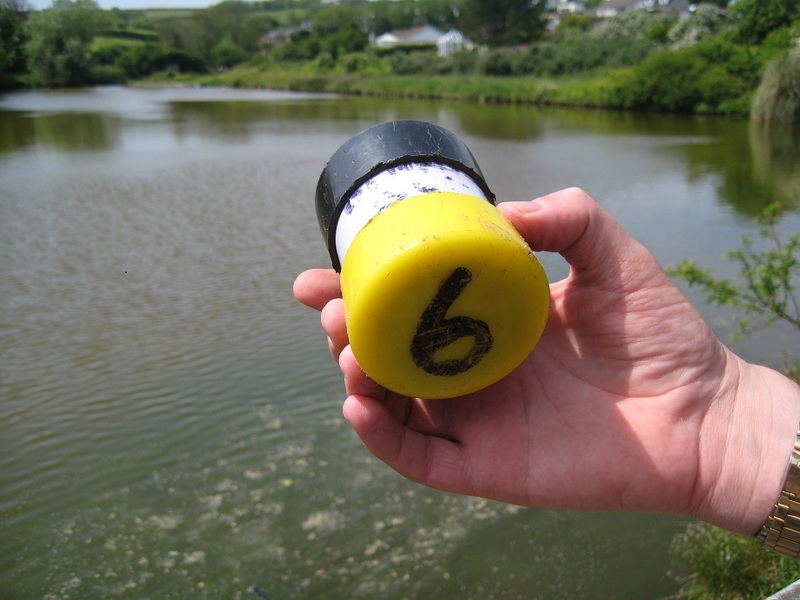 But we’d found a cache in Dorset, and extended our caching streak to eight days. 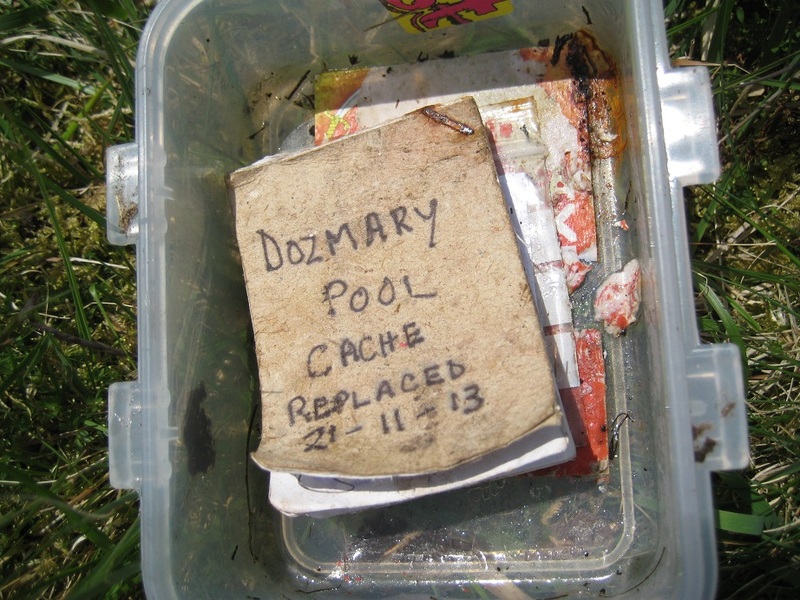 At last, a cache in Dorset! We paused for lunch, eaten within sight of that – so far only – successful cache find. 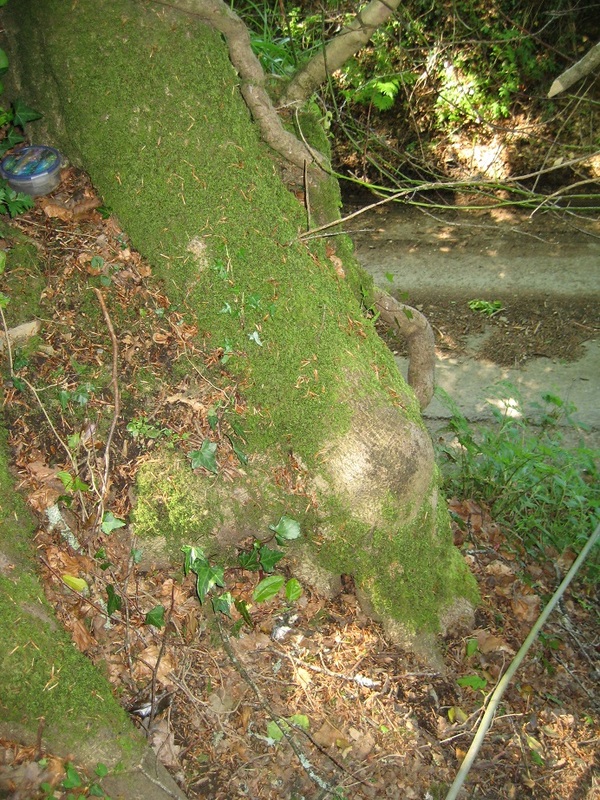 Once refreshed, we had one more cache to try for, ‘Lions Mouth’. We weren’t quite sure what to expect here, but it turned out to be a drinking trough for horses, topped by a decorative lion’s head. And the cache? We couldn’t find it. We looked around the trough, around the hedge behind (where the GPS said it should be) and round and about, but if it was there, we couldn’t find it. Wasn’t it lucky that we’d loaded three caches, not one? Yes indeed! 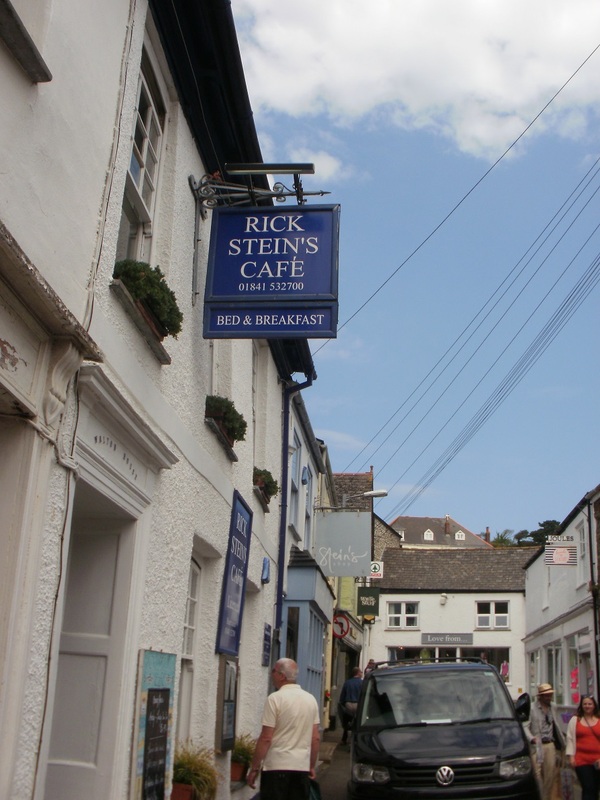 Shafted in Shaftesbury? Nearly. Back into the car we went, and home. Time to do the washing, and catch up on our sleep. It had been quite a week, geocaching-wise – most days (8) caching consecutively, most finds (30) in a day, best week’s caching (69 finds), most finds in a month (82, up to this day), most southerly cache, most westerly cache, and a chance to dip into one of the biggest geocache series in the UK. Yes, it was quite a week! 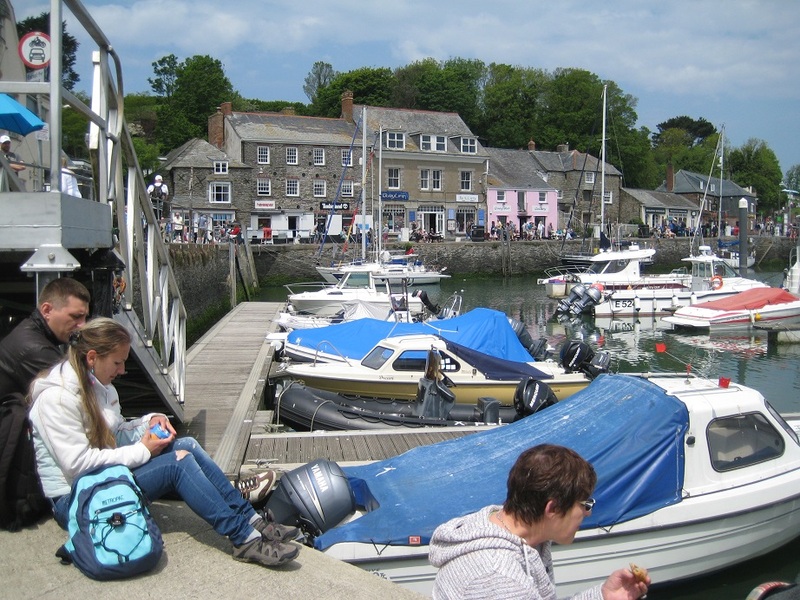 Our Cornish holiday was at an end, and with the exception of our drive home, we have yet to blog about our adventures on the Cornish Compass Series. 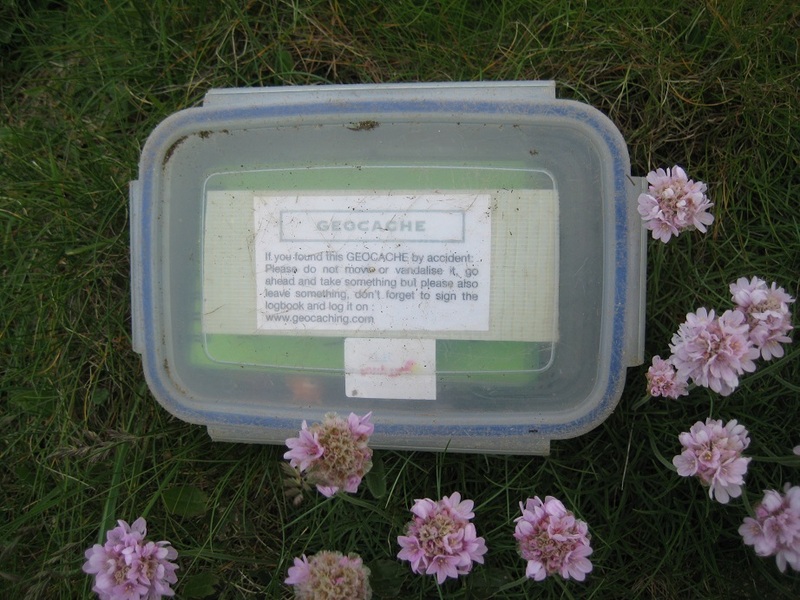 As we have remarked on earlier blogs, the series comprises of 360 puzzle caches. Each cache has a puzzle to solve to yield the final co-ordinates. On the map, the puzzle route looks circular, and although the solved co-ordinates produce a continuous loop, it is definitely not circular. The puzzles are easy to solve, and with a little help from Excel the final co-ordinates can all be derived before attempting the circuit. (We plotted every 20th cache on a map, before we left, we strongly urge plotting a lot more than this to give a very clear driving route). This is a very popular series. When we were in Cornwall two joint teams from the Lake District and the Midlands were attempting the series. Although the series is barely a year old, it already seems to have reached iconic status. 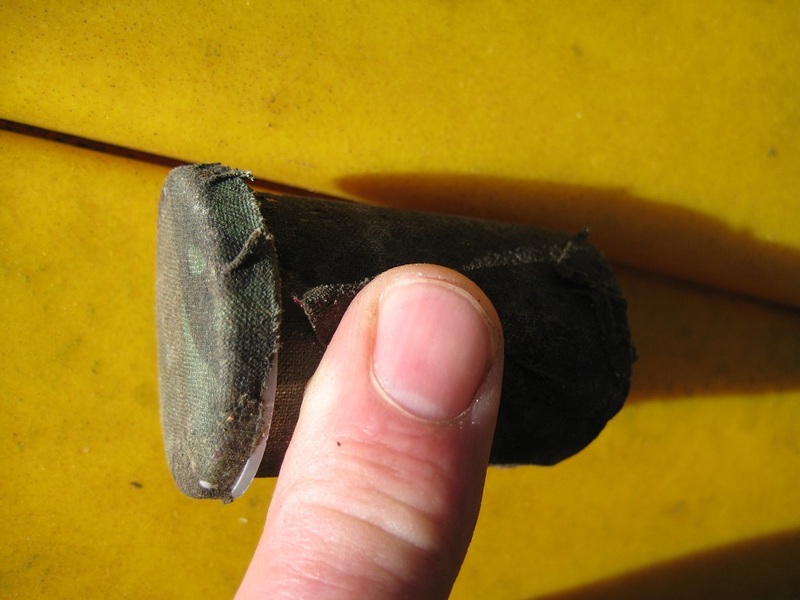 Some cachers attempt the series in a 24 hour period, others take their time, perhaps 20-30 caches a day. It really is a huge undertaking. Many of their exploits can be found at Cache 001. Other than the sheer size, the Cornish roads hinder progress. Much of the journey is on very narrow lanes with passing places. Many of the caches are in/near these passing places, but at busy times it doesn’t seem right to hold up traffic whilst looking for tupperware! 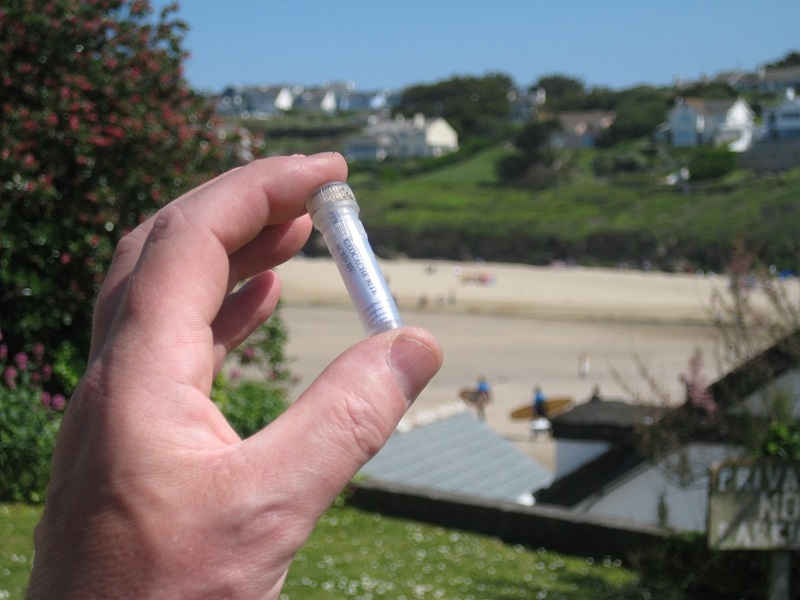 We found caches on 4 days in Cornwall. These were never our primary targets for the day, but because of our pre-plotted map we had a good idea when we were close to the series. 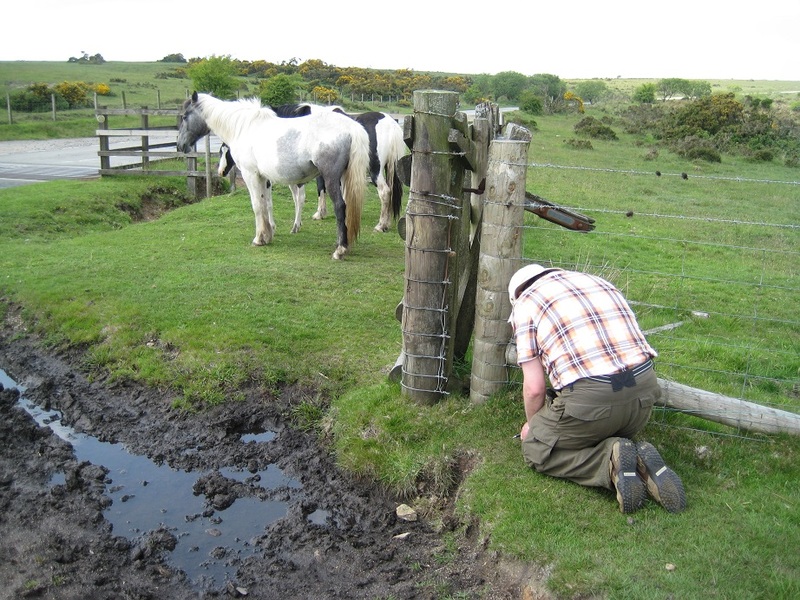 Our first day – on Bodmin Moor – we found 6 hides all very traditional ie under stones, by fences. Width-wise the roads were ok, and there were opportunities to park a car, and walk to find 2-3 caches in safety. With most caches about 1/10 a mile apart, this meant about half-a-mile of road walking. Spacious views, and space to park a car! 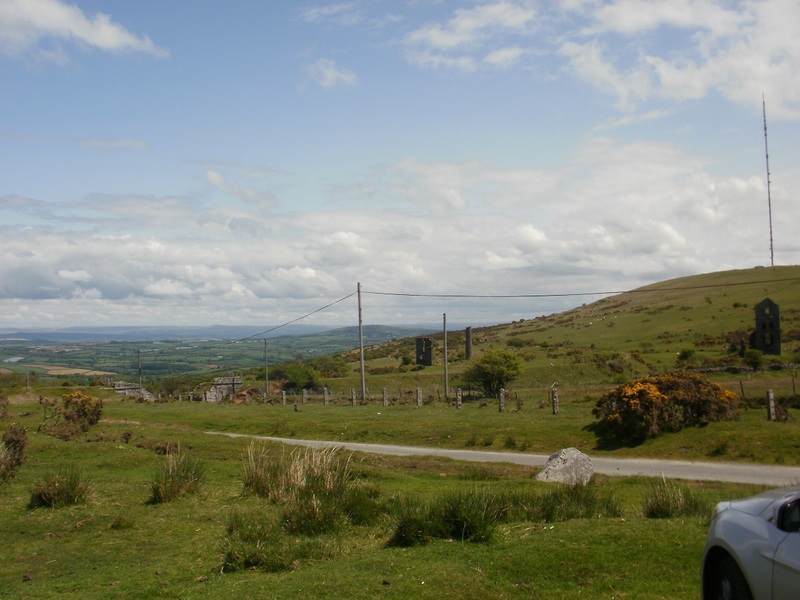 Our second day – near Liskeard – was harder. The roads were narrower and by the time we started to cache, evening peak-time was approaching, which meant there were more vehicles trying to use the narrow lanes. The parking spaces were not quite so convenient, our best pull in was just feet from a farm house. This section also yielded our only DNF – probably more of a Did Not Attempt as had blocked a resident’s drive to park our car within seconds of the resident returning! One cache which Mrs Hg137 had to find was 12 feet up a slippery bank. The nearest parking area meant we had to leave a person with the car… we really should have reversed roles here! This picture doesn’t show the effort to climb up a 12 foot slippery bank! Another was very cunningly hidden in some street furniture (and we not going to tell you how!). That day we found 5 Compass Caches, but must have driven past many more with no easy means of safely stopping. We eventually gave up, when a huge tractor came bearing down on the spot we had chosen to leave our car for a brief moment! All too stressful! 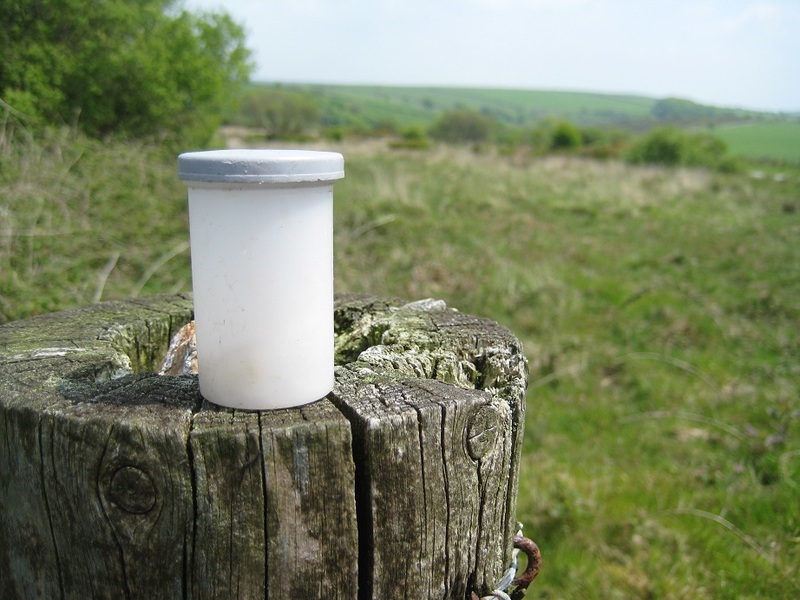 Our third day – on the way to Tintagel – we found one cache. We had hoped to find more, but our route (and we are still not sure if it was on the Cornish circle) was so narrow at one point Mr Hg137 had to reverse (slightly ineptly if truth be told) to allow a van and three other cars to squeeze past with inches to spare. Once free of the congestion, we paused to collect our thoughts in a very large layby. Turned on the GPS and we were 17 feet from a cache! An easy find. 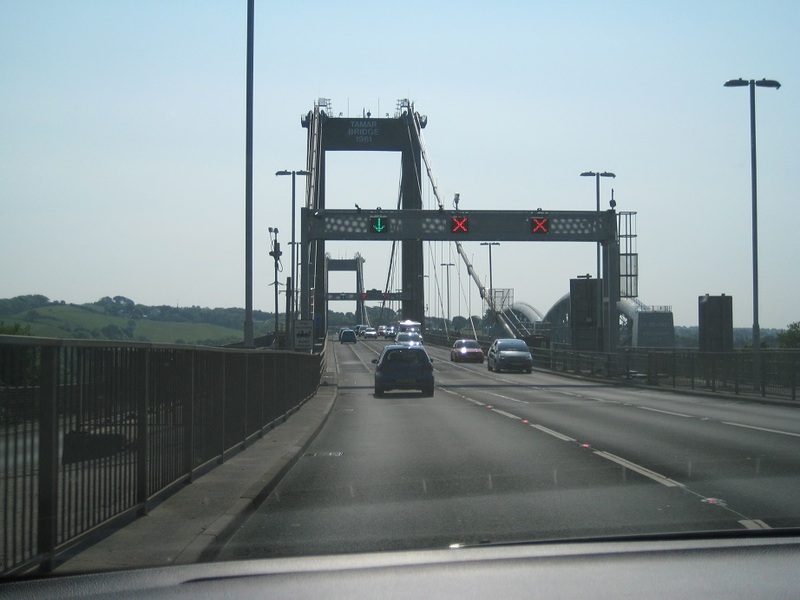 After two days of squeezing the car through seeming smaller and smaller lanes, we only returned to the Cornish Compass series three days later. We weren’t really planning to undertake any of the Compass caches that day… but we realised after finishing the ‘Drive on the Moor’ series we were just a few finds short of some personal records. Mrs Hg137 remembered passing a road sign which bore a strong similarity to one of the cache hints… so that’s where we went to first! We needed just three finds to break our daily record of 29 caches. The first in the road sign was simple. A busy road junction, and a muggle listening to the cricket in a nearby car. The next cache up a slight bank and attached by various wires to a telegraph pole… and so to our record breaking 30th cache of the day. A very simple find, with thankfully easy parking opposite! Thirty caches in a day .. our new record. So in the end we only found 15 Compass caches. 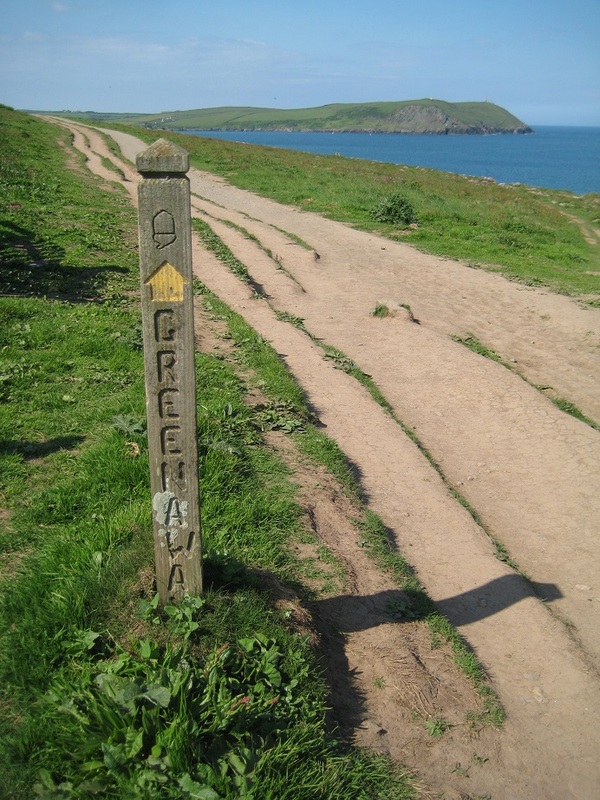 If you like driving – and stopping every 1/10th of a mile – around narrow, sometimes high-banked, Cornish lanes this route is for you. Preparation though is key. Work out all the co-ordinates beforehand, drive the route (using Googlemaps) to ascertain parking spots and to experience the narrowness of roads. If you don’t like narrow lanes (and we had our moments of dislike) you can still enjoy the route, but you may need to selective where you drive. It is fun…but hard work! Our hearty congratulations to those that success in finding all 360 caches… you have far better stamina than us! Tilly is described as a curious hedgehog who wants to see the world. She set off near the centre of Rome in October 2014, and within two days had been picked up and taken back to England. She has spent most of her time since then in England and north Wales, with a short, exotic foray to Tanzania, the Serengeti, and the NgoroNgoro crater. 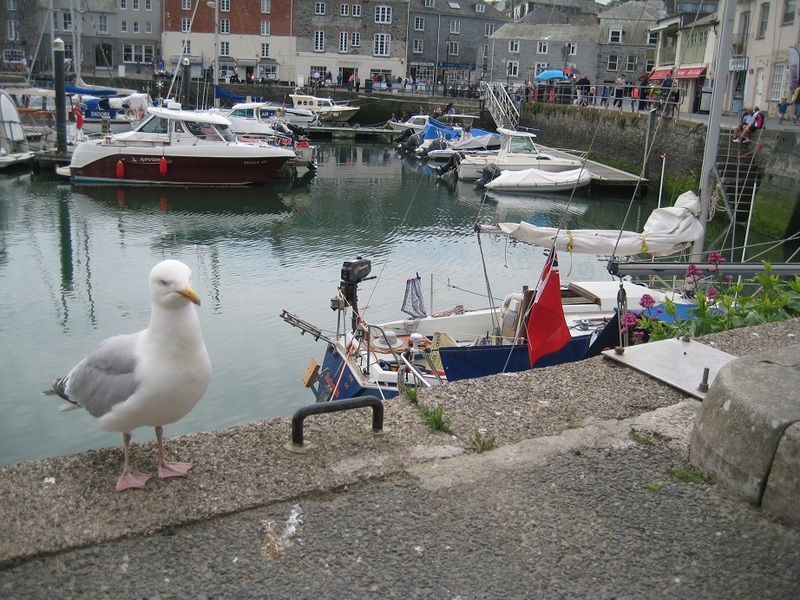 Having travelled over 12,000 miles in total, she has now arrived in Cornwall and has been doing the rounds of the many marvellous places this has to offer. It was the final day of our full-on geocaching/walking/sightseeing holiday before we headed home (to recover? 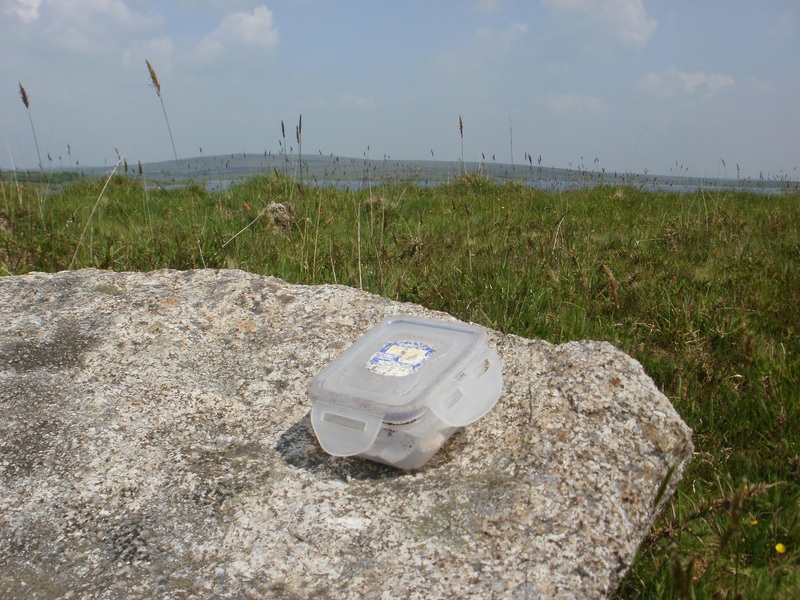 ), and we thought we would do a ‘proper’ day’s caching, rather than caches found as we saw the sights. But first – how to reach Bolventor without ending up in a Bank Holiday traffic queue? 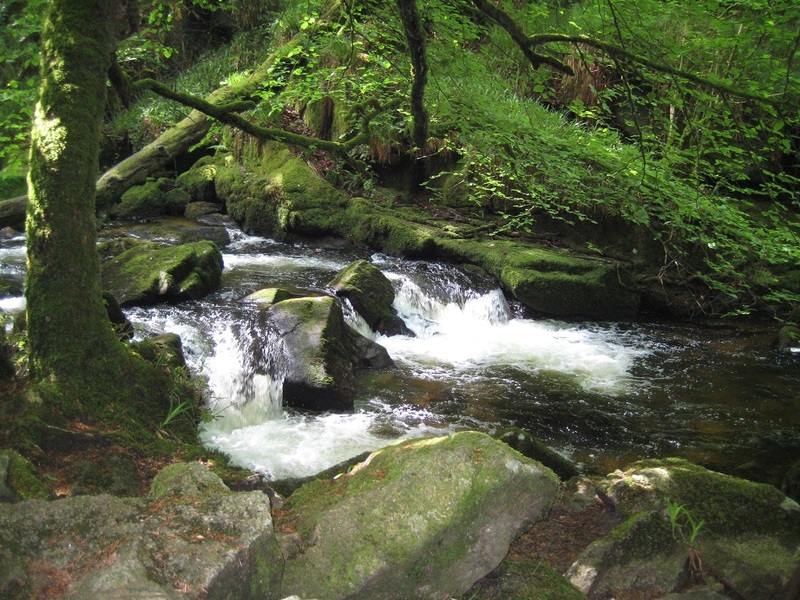 We went the back way, past Golitha Falls (http://www.bedknobs.co.uk/golitha-falls.htm very pretty, worth a visit, but needing scrambling as well as walking skills for the last bit) and then beside the River Fowey up to Jamaica Inn. A car driver stopped us near the Inn. ‘The A30’s rammed!’ he said. He was right. Where’s the cache? Just visible! 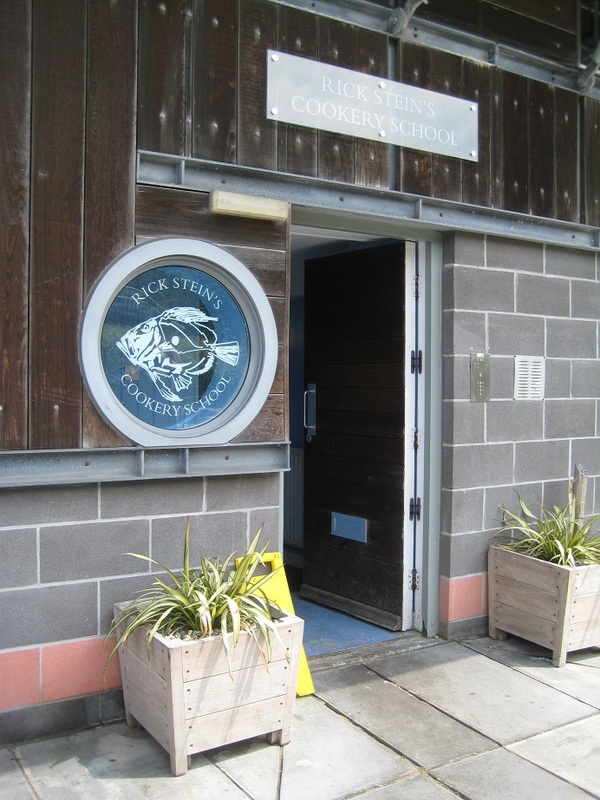 We pulled in to an equally rammed car park at Jamaica Inn http://www.jamaicainn.co.uk and pulled up near a granite post. Crikey, we were at GZ, and it was less than 3 feet from our geocar bumper! 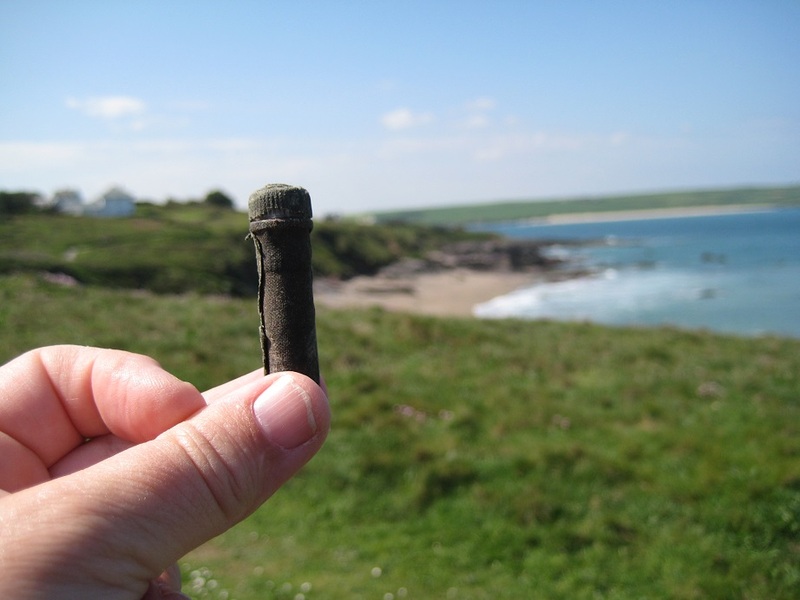 It didn’t take long to locate the cache, and we also retrieved a trackable (it wanted to stay in Cornwall – we have honoured that). A good start to the caching day! 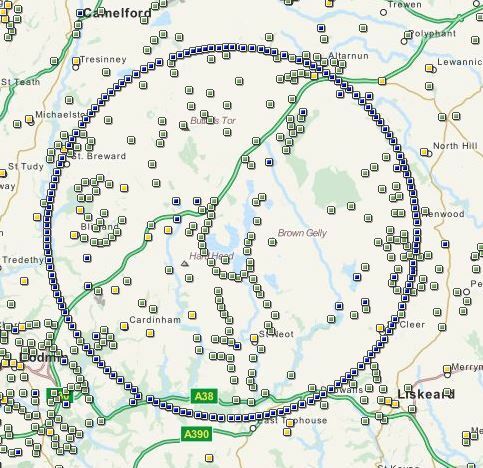 ‘A Drive on the Moor’, a series of about 60 caches, was our main goal for the day; all the caches are billed as being within 50 feet of the road/car park, and this was true. We planned to do the northernmost half of the series, heading south first of all, then looping back to the north to finish not far from our start point. It had been billed as having ‘next to non-existent traffic’ and we were looking forward to empty roads. It was not to be. Car after van after trailer after caravan was heading away from the stationary traffic on the A30. We found a small spot to park and retrieved the first cache, and a hedgehog trackable from Holland, as the cars went by. 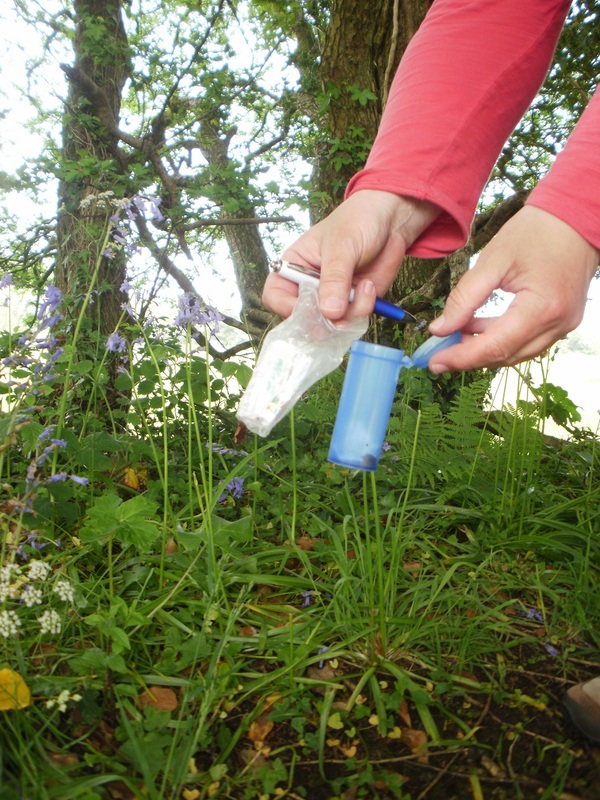 Trackables are like buses – you don’t see one for ages, then two turn up within minutes of each other… We couldn’t even attempt the next cache as the stream of traffic escaping the A30 went by and we couldn’t stop. 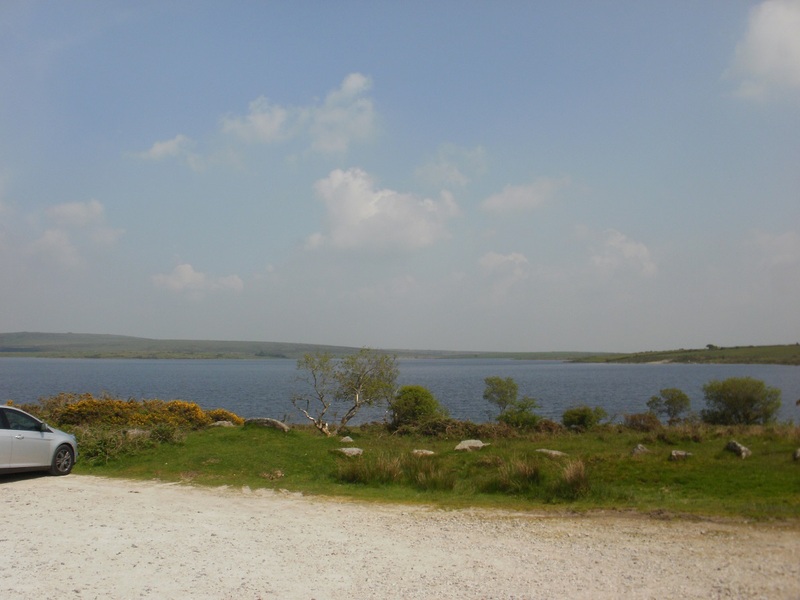 A little further on was a cache a little way away from the road and across the moor, overlooking Dozmary Pool http://www.legendofkingarthur.co.uk/cornwall/dozmary.htm This is alleged to be the place where King Arthur’s sword, Excalibur, was thrown after Arthur was mortally wounded in battle. The pool is variously described as mysterious / enchanted / atmospheric, and that is probably so on a misty day, but on this day the bright sunshine and extra traffic meant it wasn’t overly mysterious, but it is a beautiful spot with good views over the pool and the moor. 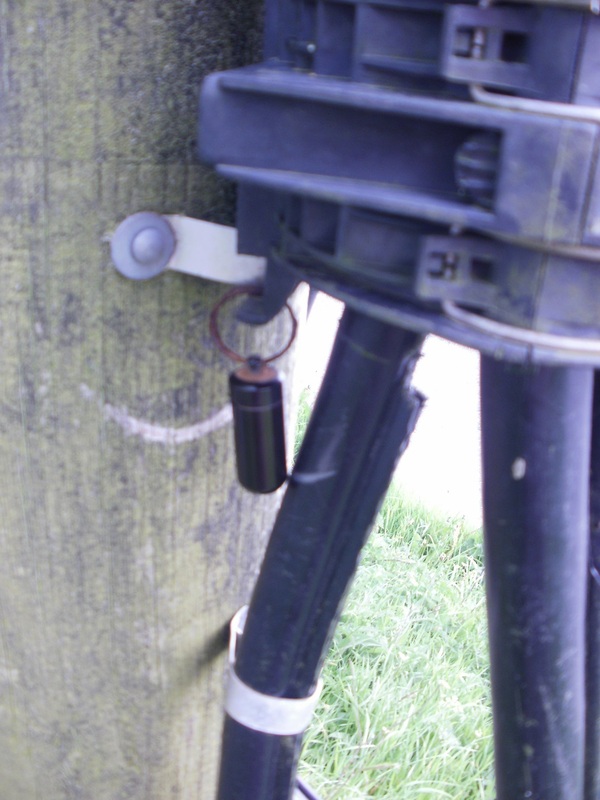 The next two caches were: drive-find-log-dash on, and the third was in such a busy spot that I was sent to find the cache while Mr Hg137 cowered by the geocar. There were good views over Colliford Lake and up to the A30 where the traffic jam still stretched from horizon to horizon. For the next cache, the roles were reversed, and Mr Hg137 did the finding. 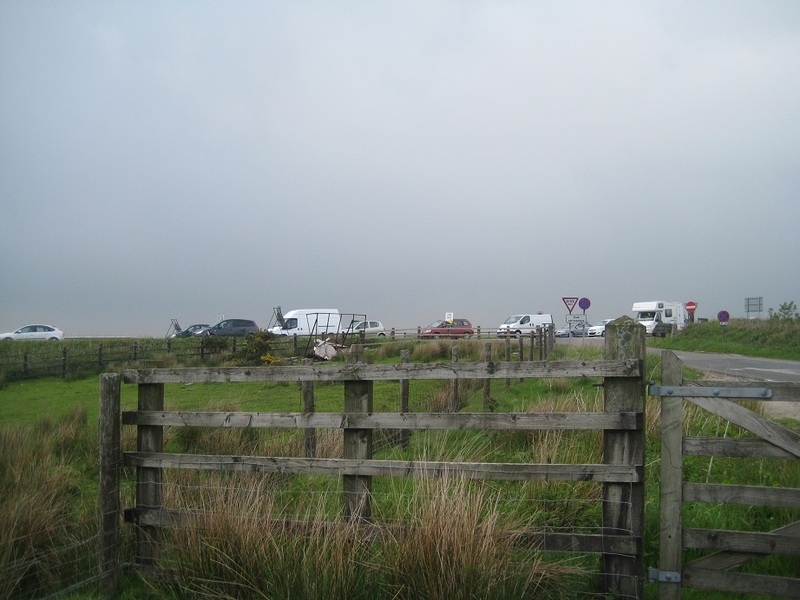 During the few minutes it took to find those two caches, maybe one-eighth of a mile apart, twenty-seven cars, one Land Rover, and a caravan came by – this really wasn’t the quiet road we had hoped for! 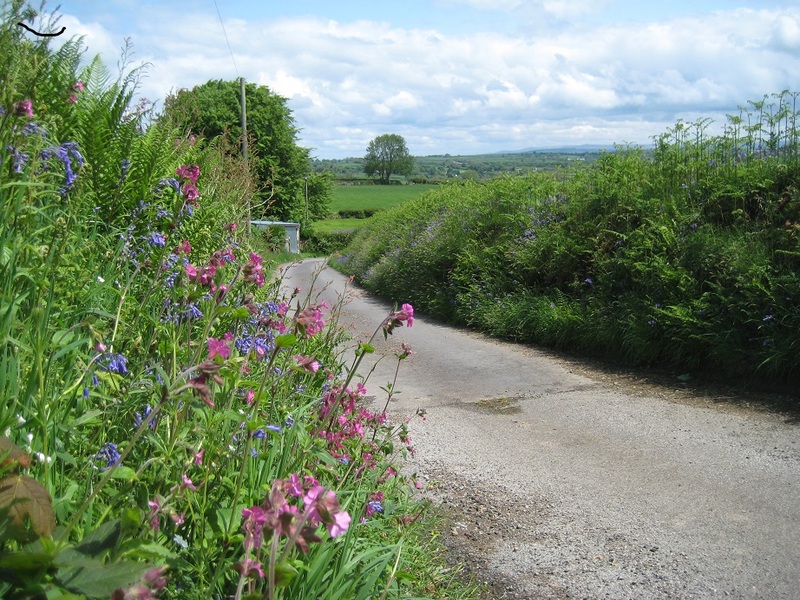 After bypassing the next two caches – the traffic was way too much for this little country road – the next two finds were quick and simple, and, better, we had now moved away from the section of road that was being used as a rat run by all those drivers … and it was now much quieter (phew, that was a relief). By now we had passed by the dam at the bottom of the lake (actually, it’s a reservoir https://en.wikipedia.org/wiki/Colliford_Lake ) and there was a handy car park where we could stop for a pleasant picnic lunch, then search for the next cache in the series. Well, the lunch and the car park were agreeable, but we didn’t find the cache (and it hasn’t been found since). 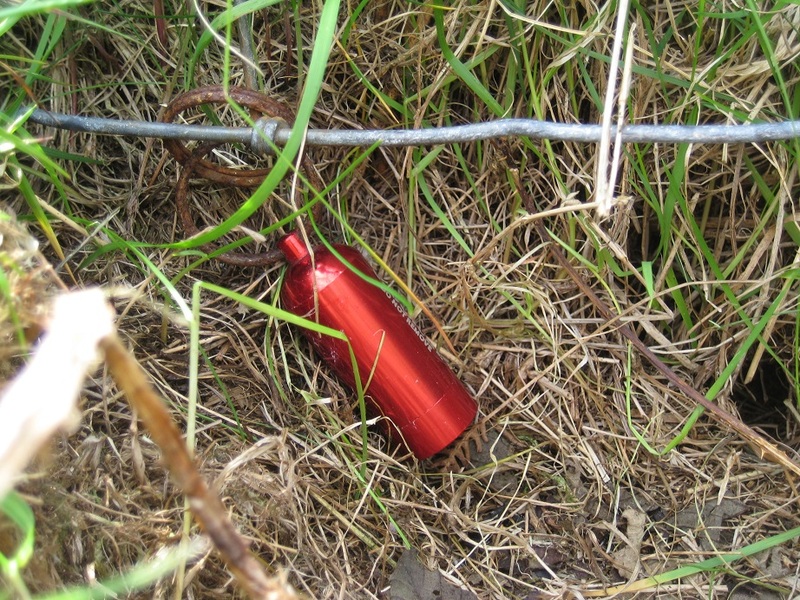 And another less agreeable thing – the area where the cache was likely to be looked to be used for something else – “walking the dog” – a colleague helpfully described it – as there were racy magazines and other …items … dotted about. We moved on. 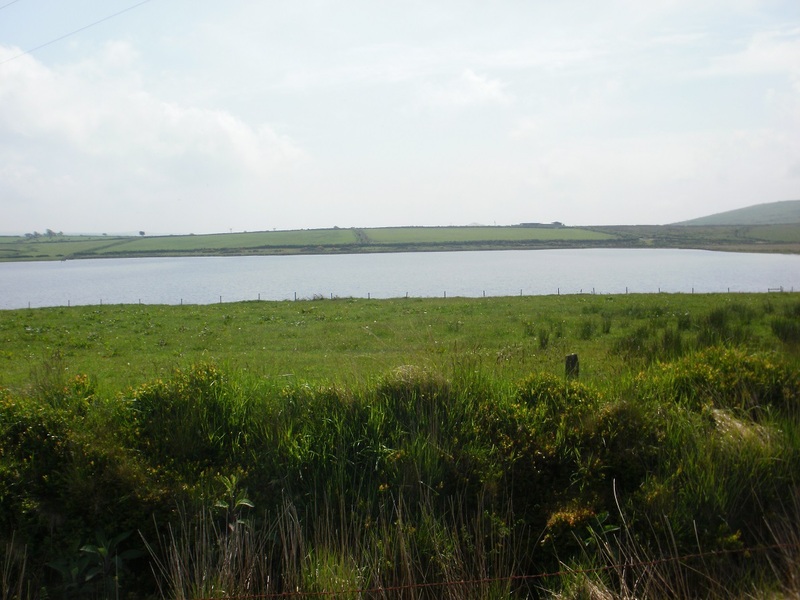 Heading north now back towards the A30, we followed the western side of the lake without always being close to it. The scenery became more open moorland, and we stopped to find (or sometimes, not find) caches at intervals. At one point, one of us acted as decoy to keep the attention of some ponies and foals while the other sneaked in behind to find a cache. And then there was another car park, with a view down over the lake. We pulled in for a coffee break, to take in the view, and find another cache. But this one was special. It was to be our 1500th cache. Woo hoo! We approached, subtly, so as not to excite notice from a couple picnicking nearby. It didn’t work; as we got closer and bent to retrieve the cache … ‘We know what you’re doing!’ We’d been rumbled – those picnickers were two other cachers, Squirrel &Stinky, on their way home after a holiday … so that’s six geocachers we’d met this week … We swapped tales of caching adventures – (they’ve been MUCH further afield than us) and offered them the log to sign; they did so, but never did log the cache; they did say that it wasn’t ‘proper’ to log something they hadn’t found. On we went, heading north back towards the A30, finding more caches as we went. We met more traffic, but this time it was coming from the opposite direction, and the road was wider, so it was less troublesome. Except for one moment while I was signing a cache log while tucked into a storm drain as traffic rushed past, uncomfortably close. The sunshine had turned hazy, cumulus clouds were massing to the north, and it was appreciably cooler and windier; if we didn’t hurry, we would get very wet. We sped up our caching; we could hear rumbles of thunder, and it got darker; the traffic escaping the A30 now had lights on. Once again, a passing muggle driver stopped to chat. 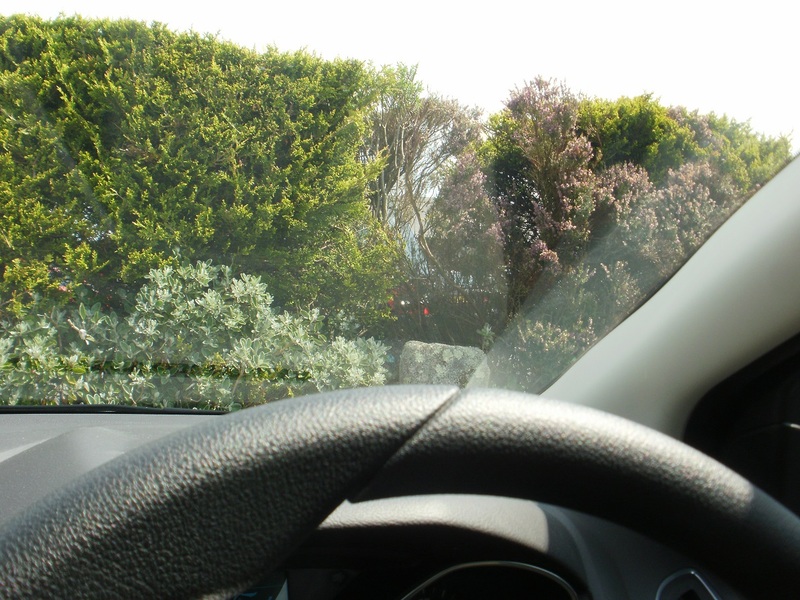 We found out from him that it was possible to turn right onto the A30 at the end of this lane – we weren’t sure it was possible till then, didn’t want to join the holiday traffic jam, and were preparing to turn round – so that was good to know. We were close to the A30 now, and could see all the queuing holiday traffic – not a good afternoon for them at all. The last two caches in the series were accomplished in gathering gloom amid rumbles of thunder; we had finished just in time. This was a super series in beautiful countryside and equally beautiful weather (except at the very end). Our one mistake was to choose the Saturday before a Bank Holiday to attempt the series, when the lanes are much busier than usual! 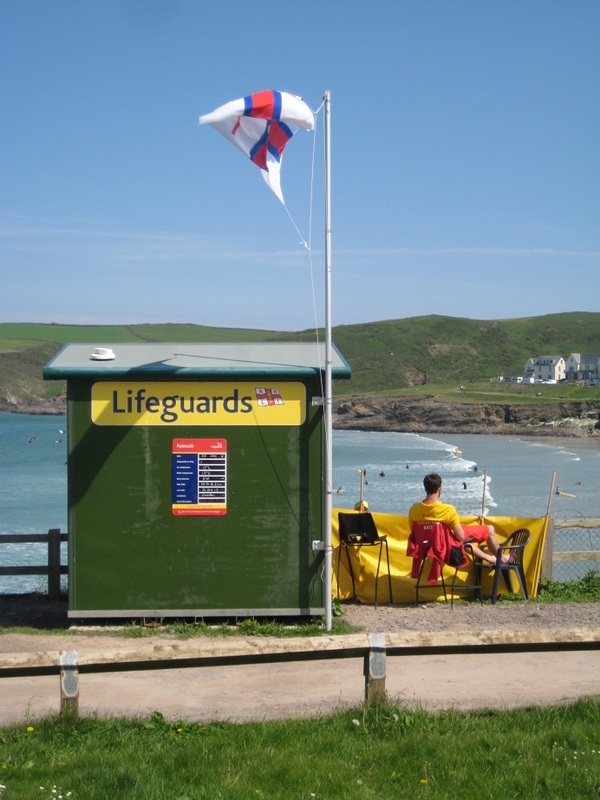 Yesterday we visited the South coast of Cornwall, today would be the rugged North coast. 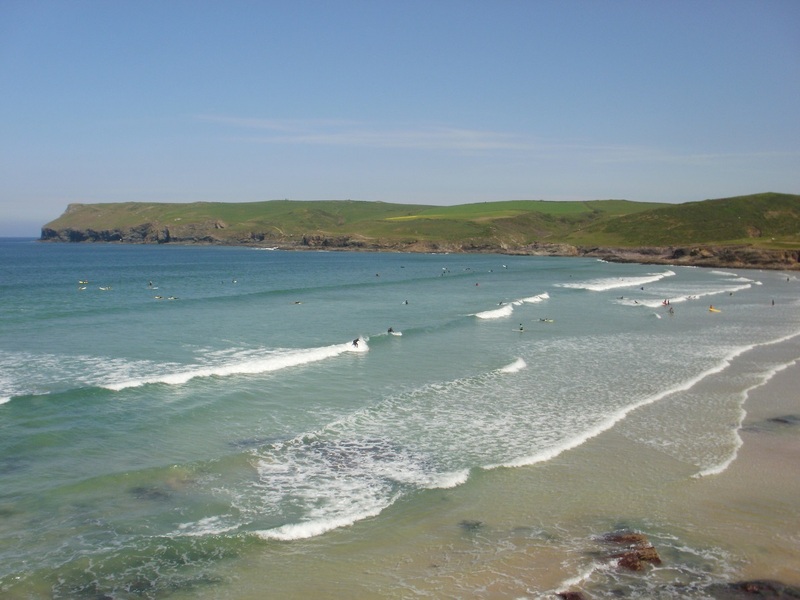 We had three destinations in mind, an Earthcache on the South West Coast Path called Ladies Window, a visit round the Arthurian town and castle of Tintagel and if, time permitted, Padstow. We paused principally to regain our composure in a layby and discovered we were within 16 feet of one of the Cornish Compass caches. We found it, and took some comfort from the fact we may not have stopped at that layby had it not been for the Southbound traffic queue we had to negotiate. 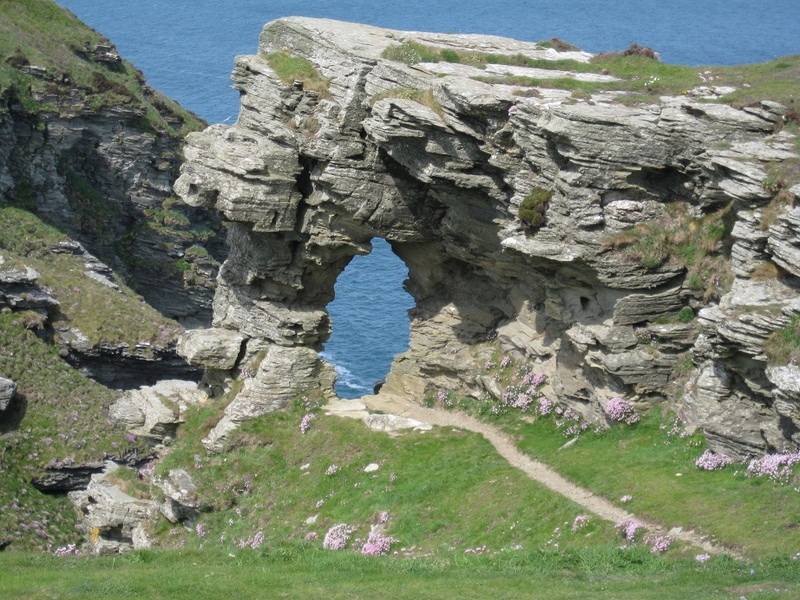 Ladies Window is a natural arch high on the South West Coast path halfway between Tintagel and Boscastle. There is no obvious car parking nearby but we managed to park near some farm buildings in the tiny hamlet of Trevalga. This left us a good half a mile walk to the arch. The arch is well hidden from the South West Coast path, indeed we walked a few yards past it before we stepped off the path to see it! Being an Earthcache there is no physical container to find, all we had to do was provide the cache owner with facts and figures about the geology, and the shape and size of the arch. While we stood thinking about the questions several other walkers went by – most seemed unaware that the arch was there and we directed them to see the arch. 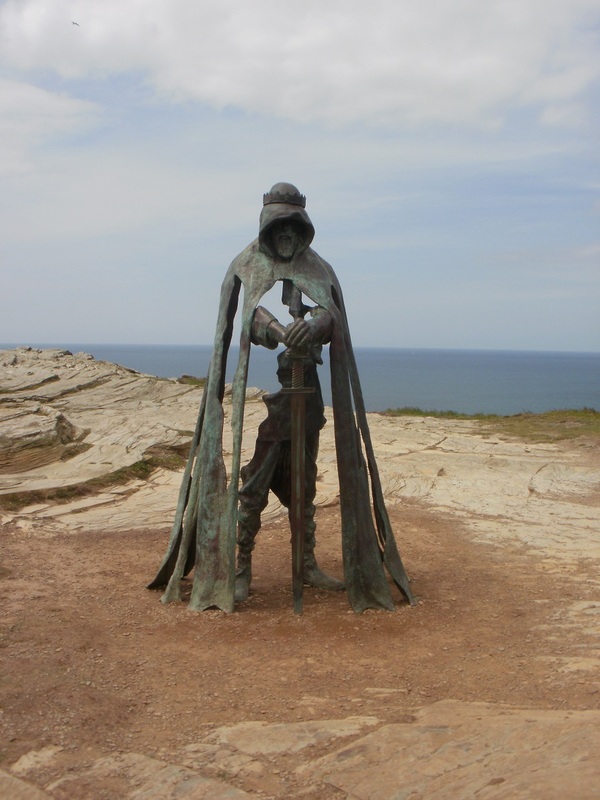 Our main sightseeing goal was Tintagel. Full of tourist shops trading on the myth that Arthur was born there. The town was heaving and we parked in the first car park we saw – sadly he furthest away from the Castle and surprisingly the most expensive! 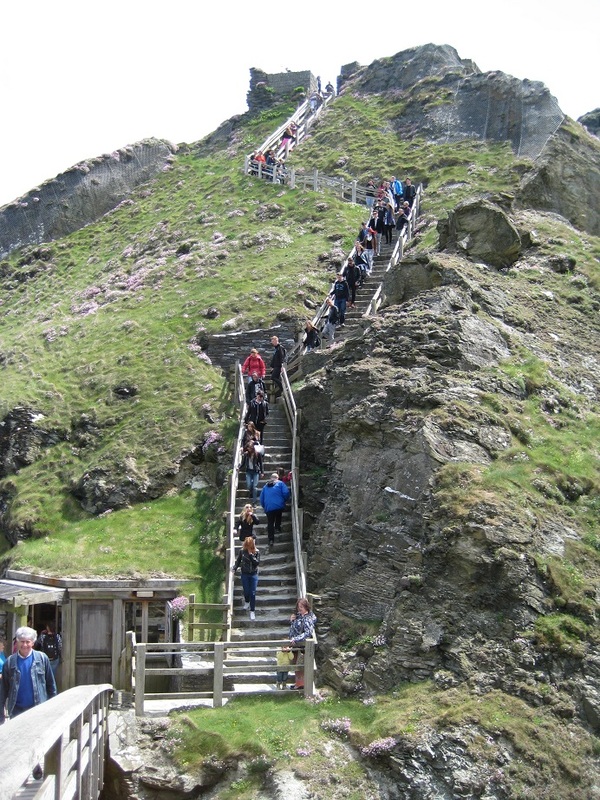 Tintagel Castle is not for the weak or faint hearted. 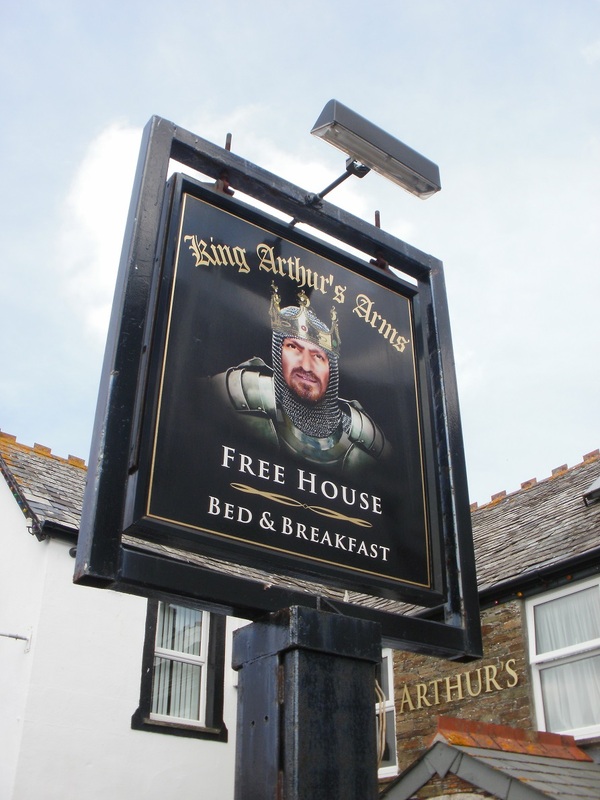 The town of Tintagel is about 280 feet above sea level, the castle (spread over the mainland and an island) are also about 280 feet above sea level. But it wasn’t a flat route between the Tintagel sites! Our route took us DOWN 200 feet, UP 100 feet, DOWN 100 feet to the causeway to the island, UP 100 feet to the Island summit, DOWN 100 feet to the causeway, a further 70 feet DOWN to the sea and then back UP 270 feet to the town! The ups and downs are not easy as much of the route is carved out of the rockface. But we got there! we went through the tunnel, and walked around walled garden.. and there at the far end of the Island was the person we were looking for… KING ARTHUR! 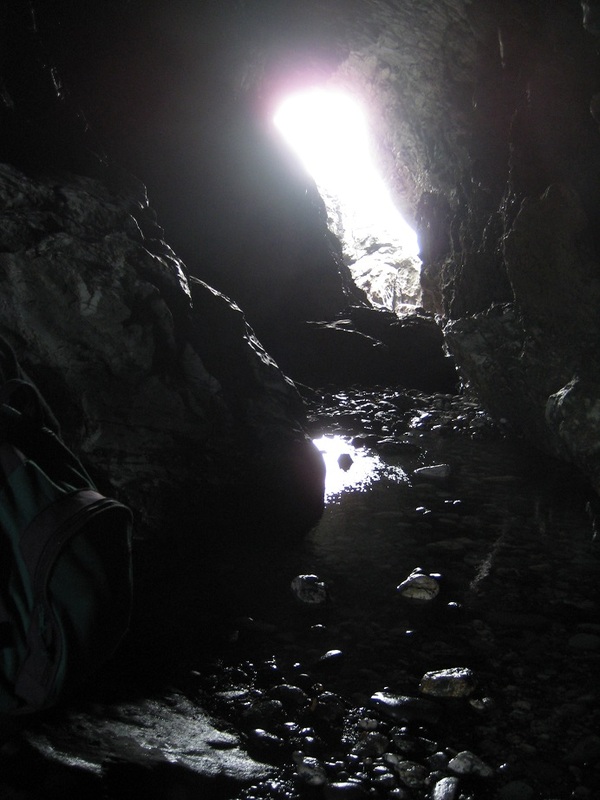 We finished on the beach, and looked in Merlin’s Cave (really a cave tunnel under the castle) and few other caves. 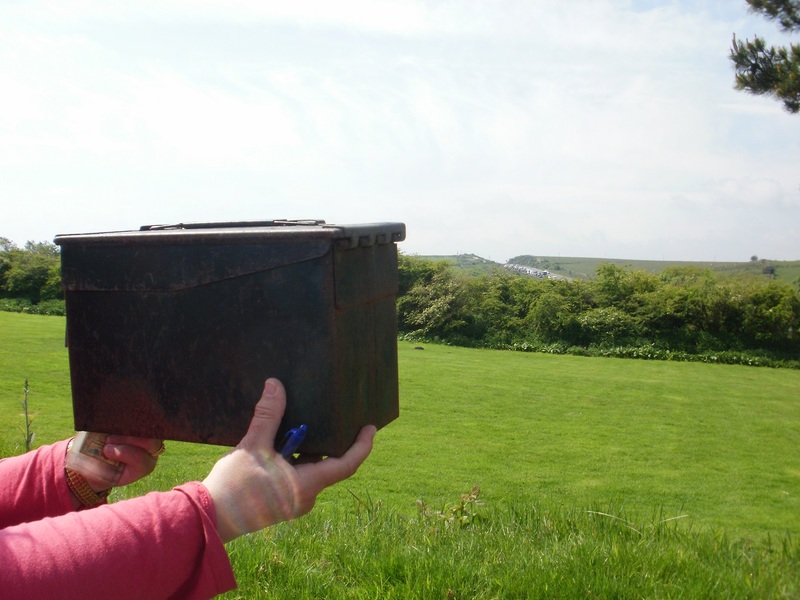 Before our final ascent to the village of Tintagel we had a cache to find. 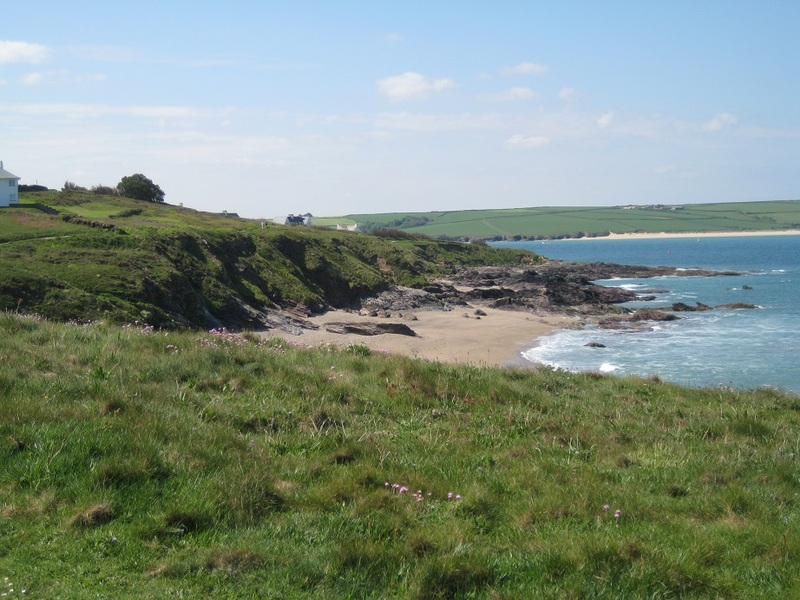 Set about a short distance from the castle and on the Coast Path we found it fairly quickly. 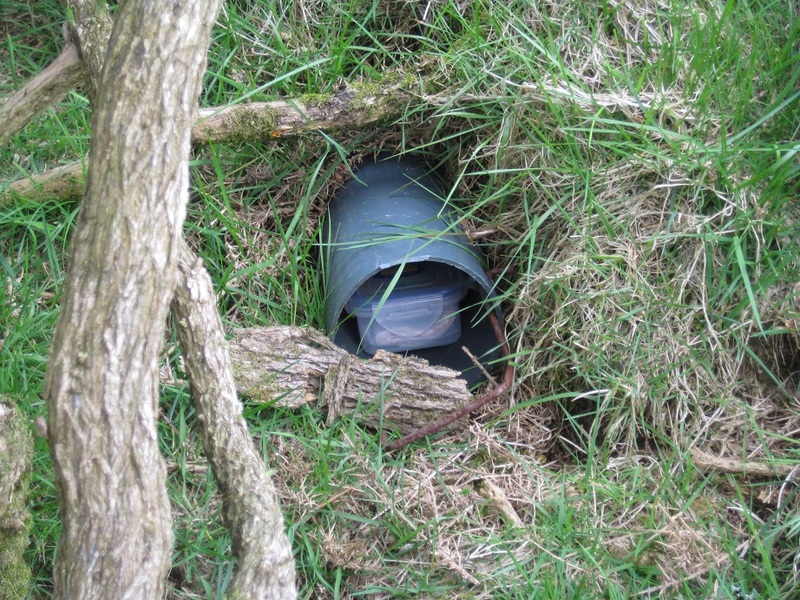 Though Mr Hg137 was asked by a passing rambler whether we was alright when his arm was half in a rabbit hole! 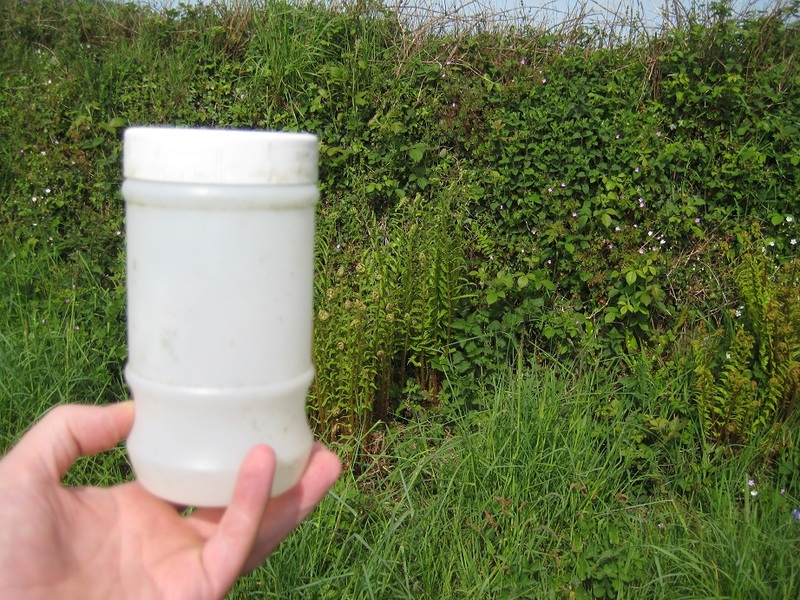 A rarity on today’s expedition – a cache! Tintagel had not got quieter. We walked away from the tourist centre to undertake a Church Micro Multi. We acquired the final coordinates (not easy from an almost illegible sign) and walked to a gate/stile nearby. Sadly we could not find the cache. We walked through the tourist town. A small nano was hidden near a seat, in the most busy part of town. We gave ourselves 10 minutes of searching, sadly another DNF! 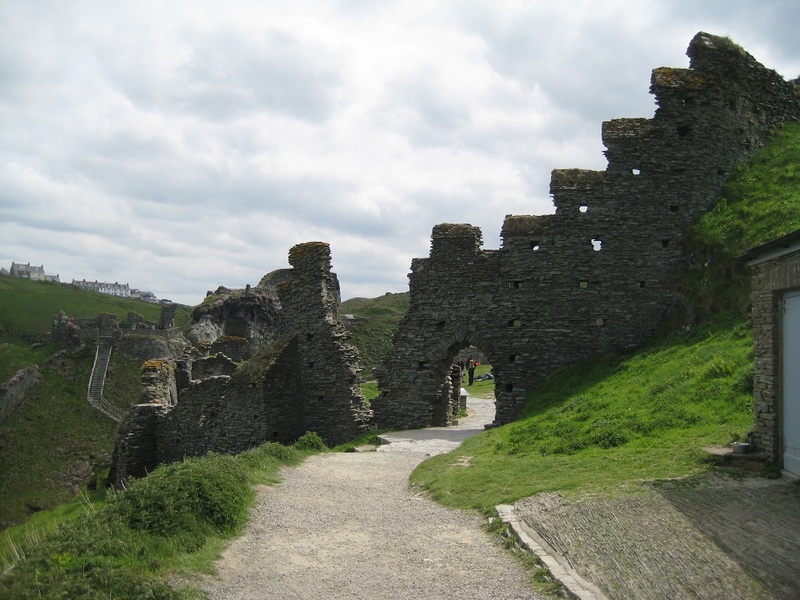 Tintagel Castle had cast its mystical spell rendering our caching powers useless! 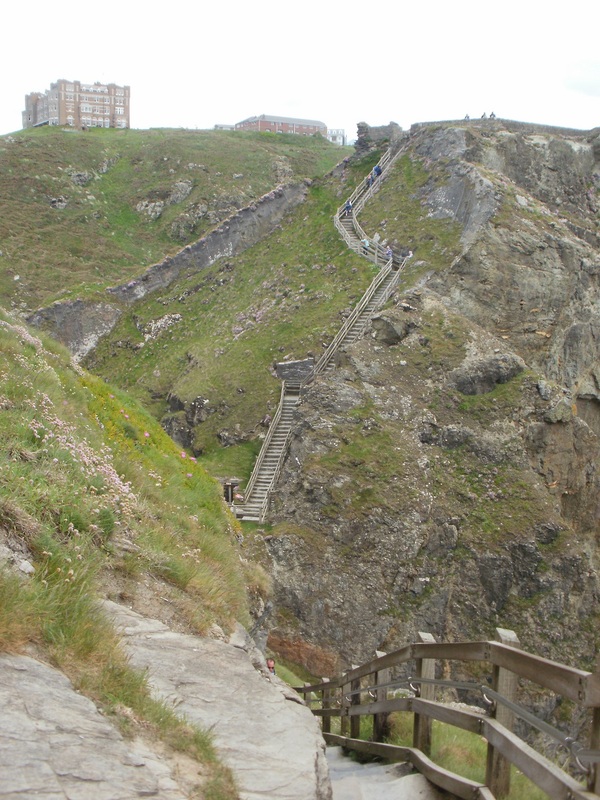 The day was getting late, we were exhausted from climbing up and down… the Ladies Window and Tintagel had beaten us, Padstow would have to wait for another day.